The phone is being sold for over Rs 1,700 on e-commerce sites. Jio is not directly selling the phone on Amazon or eBay. Reliance Jio’s most-touted feature phone with 4G VoLTE enabled feature is available on e-commerce websites now. Many vendors have been reportedly selling JioPhone through Amazon and eBay. The feature phone’s pre-booking was stopped after Jio had started taking orders for the phone in August 2017. "GADGET GEEK BUSINESS SOLUTION", a seller on Amazon, listed the phone for Rs 1,745, a report by TelecomTalk said today. However the phone was initially given an "effective" price of Rs 0 by the Mukesh Ambani backed company. A refundable deposit of Rs 1,500 after a period of three years would be granted, subsequent to regular monthly recharges of Rs 1,500. The JioPhone is available at major retail stores and Jio is not selling the JioPhone on Amazon or eBay. The feature phone also operates under a SIM-lock feature in which only a Jio SIM will be operational. The seller on Amazon has also mentioned under the product a ‘One year warranty by Jio Store all over India’. This product listed on Amazon also includes a delivery charge of Rs 49. Another seller on Amazon has listed a minimum price for the JioPhone for Rs 1,619, inclusive of Rs 37 as delivery charges. 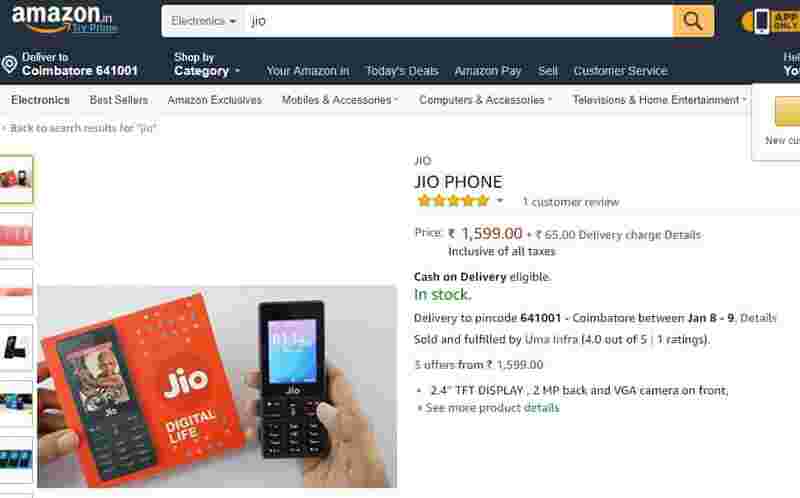 Not only Amazon, eBay venders have also listed JioPhone for a similar price. A seller listed on eBay said 39 phones were sold through the site. The phones are priced at Rs 1,599 on eBay and also entails ‘free shipping all over India’. Another seller on eBay, listed the JioPhone as "JIO KEYPAD FEATURE PHONE BLACK", offered the phone at Rs 1,740. Reliance Jio did not respond to a query sent by Zeebiz. Besides having 4G VoLTE feature the JioPhone has a 2.4 inch display, TFT screen and QVGA (320 x 240) screen resolution. It also has a 512MB of RAM, 4GB of internal storage which can be further expanded up to 128GB with a micro SD card. JioPhone comes packed with 2MP rear camera and a VGA camera.